This portrait was painted in 1900. Nicholas II ordered it as a gift to his wife Alexandra Fedorovna. By the way, it was her fault that the process of creating the picture almost stopped. Valentin Serov could not tolerate interference in the creative process, and the sovereign’s wife did not hesitate to take a brush and notice aloud the shortcomings of the recreated image. Unaccustomed to holding back his opinions and views, Serov, in a straightforward and easy grin, suggested to Alexandra Fedorovna to complete his work on her own. As follows from the historical records, after this the Tsar’s spouse did not dare to “teach” the creator anymore. It should be noted that Valentin Aleksandrovich was equally bold and frank in depicting his models, which is why many customers were eager and at the same time afraid to pose for the master, fearing to completely expose their not very good-looking sides. Nevertheless, contemporaries consider the portrait of Serov unquestionably and unanimously the best. He managed to catch the human essence of the Russian emperor. The last of the Romanovs is dressed in everyday military uniform, the pose is relaxed. In general, the whole face of Nicholas II is devoid of pathos and arrogance. A gentle and intelligent man with a clear dreamy look. Anxiety and experience are read in the eyes of the autocrat, he is handsome and sad. Such was the personality of the emperor – great, uneasy, overly sensitive and delicate. The image of the king is devoid of the peculiar formality, it is a “homemade” and surprisingly warm image, first of all, of a common man, and not of the emperor. With the help of restrained colors and light movements of the brush, Serov emphasized the youth of Nicholas II. Low-key tones of black, gray and brown shades give expressiveness to the face and concentrate attention on the sovereign’s eyes. The manner of execution of the picture is somewhat similar to the sketch, but well thought out and lyrical. 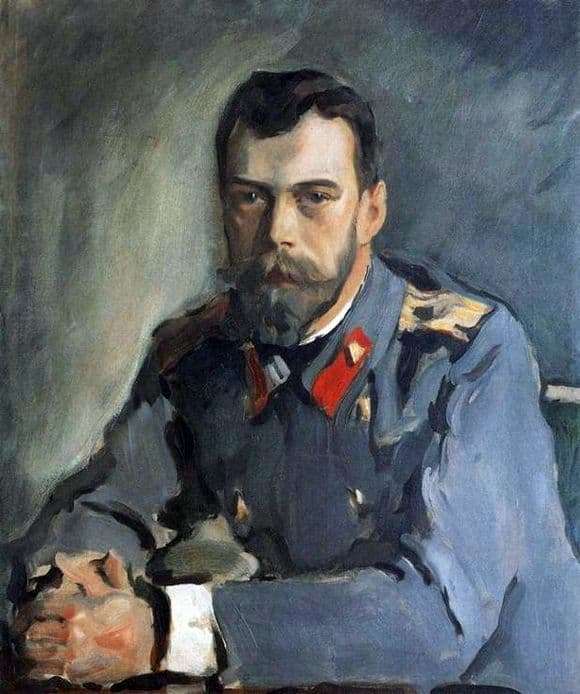 Unfortunately, the original “Portrait of Nicholas II” was destroyed in 1917 during the storming of the Winter Palace. The author’s copy of the canvas is stored today in the Tretyakov Gallery.